The teams rushed back from France to prepare for the British Grand Prix and there were a number of new cars in the entry list, notably the first Williams (known as a Politoys). There was also another British car called the Connew, which was being driven by Francois Migault. The entry was slightly smaller than usual as BRM had given up running five cars and decided to concentrate on three. With Helmut Marko permanently out of action because of his eye injury, BRM took the moment to have a clear-out and dropped both Howden Ganley and Reine Wisell and took on Jack Oliver instead to partner Jean-Pierre Beltoise and Peter Gethin. Regazzoni was still out of action with a broken arm (from a football accident) and with Mario Andretti racing in the United States, Ferrari gave its sportscar driver Arturo Merzario an opportunity in F1. Nanni Galli, who had raced for Ferrari in France, went back to the Tecno team. Qualifying resulted in Jacky Ickx taking pole in his Ferrari with Emerson Fittipaldi alongside in his Lotus. Peter Revson (McLaren) shared the second row with Jackie Stewart (Tyrrell) while Tim Schenken was again quick in the Surtees and qualified fifth, ahead of Beltoise's BRM. The top 10 was completed by Mike Hailwood (Surtees), Ronnie Peterson (March), Merzario and Carlos Reutemann (Brabham). Ickx took the lead at the start with Fittipaldi second and a fast-starting Beltoise third. Then came Revson, Stewart, Schenken and Peterson. Stewart was the man on the move and moved ahead of Revson on lap three and Beltoise on lap seven. he then closed up on Fittipaldi and took second place on lap 25 although Fittipaldi fought back and retook the position on lap 36. Ickx was only just ahead of them. On the 49th lap, however, Ickx slowed with an oil pressure problem and so the battle for second became the fight for the lead. Revson was running in a lonely third place. The order remained unchanged until the finish. 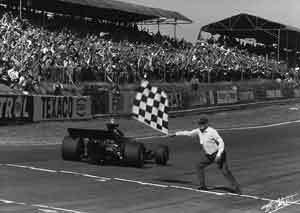 Fourth place looked to be safe for Peterson after Cevert crashed on lap 61 but on the 75th lap the March 's engine cut at Paddock Hill Bend and Peterson crashed into the cars which had been abandoned by Cevert and Graham Hill. Amon took fourth place with Hulme fifth and F1 debutante Merzario sixth.